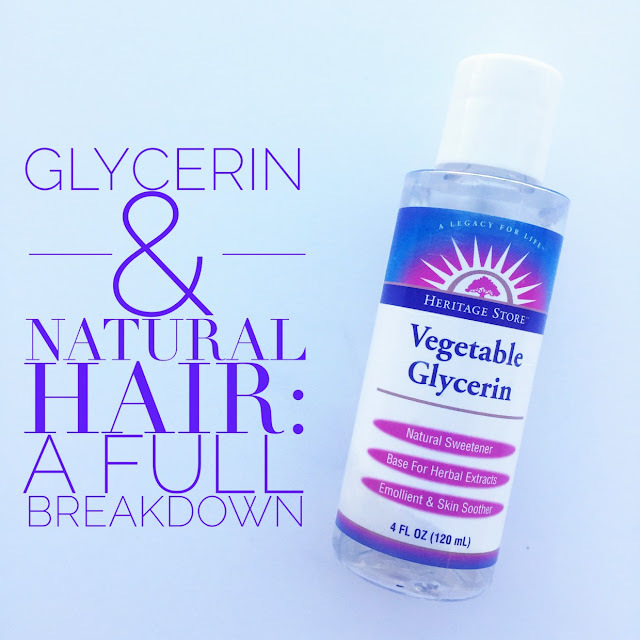 Before now using glycerin for natural hair had always been a tricky topic for me. I sort of understood the purpose of the ingredient in hair products but I was still lost on the whole weather, dew point aspect. Like many, I saw other popular bloggers and vloggers using glycerin for natural hair, creating DIY recipes so I figured why not. Glycerin is also listed in about every product I own so I figured the ingredient…couldn’t hurt right? The good news is ever since I started blogging I’ve become way more informed about the science behind growing and maintaining healthy natural hair and my research game is on another level. (Yay me!) Instead of just taking someone else’s word, I now seek out additional information to form my judgement. Now I know everyone doesn’t have time for that, which is why you are here so let’s dive right in! And if you were completely lost after reading the first paragraph then definitely keep reading. Glycerin, also known as glycerol, is a thick, odorless clear liquid derived naturally from plant oils such as palm, soy or coconut oil or synthetically from petroleum. Chemically, glycerin is a water-soluble conditioning sugar alcohol with 3 hydrogen bonding properties, making the substance great as a moisturizer in other products besides just hair care. Glycerin is commonly used in the creation of soaps, toiletries, drugs, and some beverages as a sweetener and preservative. Trust me the list goes on and on. Without inundating you with too much scientific lingo glycerin at the core is a type of humectant, which means it attracts moisture to itself. The hydrogen bonding properties of humectants attract water from the atmosphere bringing moisture to the hair and ultimately improves moisture retention for the hair. As a result, Glycerin and other humectants are widely popular in products that promote ridding yourself of dry, thirsty hair. Glycerin is also used as a thickening agent in many products to create the nice fully texture I absolutely love. While glycerin has an immense ability to attract moisture to the hair it also has the reverse effect. Everything is about balance. On extremely humid days too much moisture can be attracted to your hair causing the hair to swell and frizz. However, on low humidity days (cold, dry days) where the surrounding air is more dry than your hair, the opposite occurs. Moisture is drawn from the hair back into the air to balance the moisture in the atmosphere. Think of it this way…it’s not about YOU at all but, the balance of moisture in the atmosphere. Hopefully that makes sense. If not, let’s run it back again. On high humidity days moisture from the air is drawn TO other things for balance and on low humidity days moisture is drawn FROM things back into the air for balance. How do you know if the humidity is high or low outside? Most weather apps will plain out list the humidity % or the dew point. The higher the dew point, the more moisture is in the air. So What’s the Big Deal About Glycerin and Natural Hair? The big deal is ingredients matter. Your environment matters. And your specific hair needs and texture matter. If you have extremely dry hair glycerin can be your best friend, when used correctly. Too much glycerin if not correctly diluted can leave the hair feeling sticky due to the thick viscosity of the ingredient. Luckily products containing glycerin have already done the hard part for you mixing all the great ingredients together. However, pay special attention to the order of how ingredients are listed. Companies label ingredients based on order of dominance, meaning the first ingredient is more prevalent in the product, then the second and so forth. Depending on what my hair needs, the climate outside, and the style I want to achieve I know whether or not I need to use a product that contains a lot of glycerin or just a little. For example, last week I twisted my hair with Cantu Coconut Curling Cream where glycerin is the second ingredient listed. Not only did my hair not dry all the way, but the next morning was a rainy, warm spring day filled with lots of humidity. My hair frizzed before I even made it from the parking lot to my office. In retrospect, I should have probably used more of a twisting butter, for example Karen’s Body Beautiful Super Duper Hydrating Cream where vegetable glycerin is the second to last ingredient. Both great products but serve two purposes for me depending on the day. As mentioned above, many women create their own glycerin mix to refresh curls or the hair daily. Here’s a quick recipe I’ve tried before as well mixing in a spray bottle. Feel free to play around with the ingredients to get the right concoction for your texture but just remember to ALWAYS dilute glycerin with water.